Home > Events >9th International Micro Irrigation Conference < [ Handbook of Procedures for ICID Events ] > Previous conf. 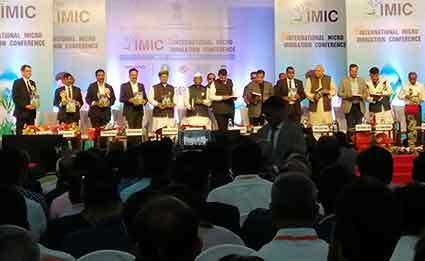 The 9th International Micro Irrigation Conference was successfully held at Aurangabad, India from 16-18 January 2019. The conference was inaugurated by Hon'ble Union Minister Mr. Nitin Gadkari (Ministry of Road Transport and Highways, Shipping and Water Resources, River Development and Ganga Rejuvenation, Government of India); presided by Hon'ble Chief Minister of Maharashtra Mr. Devendra Fadnavis, and Hon'ble Union Minister Mr. Radha Mohan Singh (Ministry of Agriculture and Farmers Welfare, Government of India). ‘Micro Irrigation in Modern Agriculture,’ the theme of the conference aimed to share experiences in the use of new technologies and best management practices in drip, micro-sprinkler and other localized irrigation systems with sub-themes focusing on (i) Design, Innovations, and New Techniques for increased Crop Productivity; (ii) Micro-irrigation funding and Government support; (iii) Micro Irrigation for ‘Cluster Level Farming and Small farm holders’; and (iv) Operation and Maintenance Services and Capacity Development for the Micro-Irrigation Systems. Hon'ble Minister Dr. Mahendra Reddy (Ministry of Agriculture, Rural and Maritime Development and Waterways and Environment, Government of Fiji) graced the occasion as a Special Invitee. Guests of honour: Hon’ble Minister of State Mr. Arjun Ram Meghwal (Union Minister of State in Ministry of Water Resources, River Development & Ganga Rejuvenation and Parliamentary Affairs in Government of India); Hon’ble Minister Mr. Girish Dattatray Mahajan (Minister for Medical Education, Water Resources and Command Area Development, Government of Maharashtra); Hon’ble Minister Dr. Deepak Sawant (Minister of Public Health and Family Welfare, Guardian Minister of Aurangabad District, State Government of Maharashtra); Hon’ble Minister Mr. Vinoda Datarama Paliencar (Minister for Fisheries and Water Resources Department, State Government of Goa); Hon’ble Minister Mr. Mahender Singh Thakur (Minister for Irrigation and Public Health, Horticulture and Sainik Welfare, State Govt. of Himachal Pradesh); Hon’ble Minister Mr. Satyendra Kumar Jain (Minister for Irrigation and Flood Control Department, Power, PWD, Health and FW, Govt. of NCT Delhi); Hon’ble Minister Mr. Satpal Maharaj (Minister for Irrigation, Flood Control... State Govt. of Uttrakhand); Hon’ble Minister Mr.C.S. Puttaraju (Minister for Minor Irrigation and Water Resources Department, State Govt. of Karnataka); Hon’ble Minister Mr. Surya Pratap Shahi (Minister for Agriculture Education and Agriculture Research, State Govt. of Uttar Pradesh); Hon’ble Minister Mr. Om Prakash Dhankar (Minister for Agriculture Development and Panchayat, Irrigation, Animal Husbandry and Dairying Fisheries…, State Govt. of Haryana); Mr. Chandrakant Kant Khaire (Hon’ble Member of Parliament Lok Sabha, Aurangabad). Union Minister of Road Transport and Highways, Shipping and Water Resources, River Development and Ganga Rejuvenation Mr. Nitin Gadkari inaugurated the event as the chief guest and was presided by Hon’ble Chief Minister of Maharashtra Mr. Devendra Fadnavis. Union Minister for Agriculture and Farmers Welfare Mr. Radha Mohan Singh, Minister of State for Water Resources, River Development & Ganga Rejuvenation and Parliamentary Affairs Mr. Arjun Ram Meghwal, and Ministers from several state governments also presided as the guest of honour during the event. Hon'ble Minister Dr. Mahendra Reddy (Ministry of Agriculture, Rural and Maritime Development and Waterways and Environment, Government of Fiji) graced the occasion as a Special Invitee. Mr. U.P. Singh, Secretary, MoWR, RD&GR, Govt. of India); Mr. S. Masood Hussain, Chairman, (INCSW, Central Water Commission); Er. Felix B. Reinders, President and Er. A.B. Pandya, Secretary General from ICID were also present during the conference. Speaking on the occasion, Mr. Gadkari stated that micro irrigation is a game changer in agricultural development. He termed the replacement of the Canal system by pipe system as a revolutionary move and emphasized that the Central government is taking several new initiatives for water conservation. Mr. Gadkari said it is time to think of change in crop pattern considering the availability of water and further emphasized on new technology, new innovation and new research for agricultural sector which will help in increasing productivity. The three-day conference witnessed a large group of eminent international and national experts and local farmers sharing their experiences in the field of latest development in micro irrigation technology to enhance crop production and water management for optimal use in agriculture, technical and sociological interventions for sustainable water, food and agriculture. As a part of the conference, Water and Land Management Institute (WALMI), Aurangabad organized a one-day “National Micro Irrigation Workshop for Farmers” on 15 January 2019. Around 200 farmers from various states of the country participated in the event. The event was graced by Mr. Uday Chaudhari, Collector & District Magistrate of Aurangabad; President Reinders and Mr. Girraj Goyal, Director, MoWR, RD&GR. President Reinders made a presentation on Micro Irrigation and introduced different practices and technologies used in various countries. On special request from the farmers, the presentation was interpreted in Hindi and was very well received. At the end of the first session, President Reinders, Vice President Dr. Marco Arcieri and other invited guests also planted saplings in the WALMI complex. The event initiated a multi-disciplinary dialogue for discussions and deliberation through seminars, exhibitions and sessions and raised awareness regarding large-scale use of micro-irrigation including new techniques in micro-irrigation for increased crop productivity, micro-irrigation in cluster level farming and canal irrigation systems. Irrigation minister’s roundtable, farmer’s pavilion and NGO sessions, handcrafts mela, workshops on specific crops and specific agro-climatic zones were also organized during the conference, apart from the presentation of micro-irrigation awards to farmers, practitioners, companies and government. Additionally, the event aimed to address the problems of developing as well as developed nations in the context of present-day challenges. Around 700 delegates including 100 foreign delegates from 30 countries participated in the conference that provided a global platform to professionals and exhibitors to showcase their knowledge and technologies from around the world.